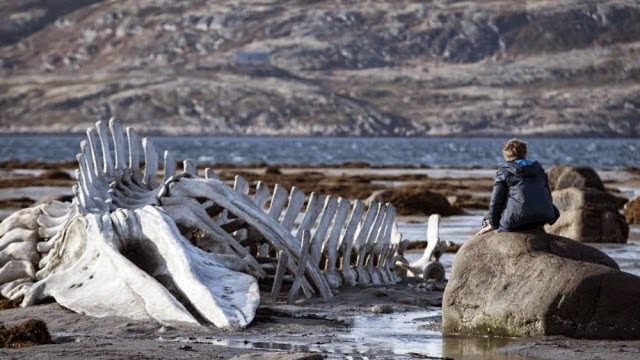 A wide-reaching political allegory that squarely targets the aggression of the Putin regime, Leviathan is the award-winning fourth feature from director Andrey Zvyagintsev. Rarely utilising close-up, Zvyagintsev’s camera gazes from the middle distance. Using the visual language of the epic, his wide shots capture the remote, windswept seaside environs of working-class Russia. The simplicity of these compositions facilitate a searing intimacy with the characters, enlivening what might otherwise have seemed didactic. Kolya (Aleksei Serebryakov), is a hot-headed mechanic whose land is being appropriated by the local government for construction purposes. Kolya’s teenage son and put-upon younger wife, Lilya, (Elena Lyadova) are resentful and terrified of losing their home, which will be bulldozed under the government’s plans. The crooked mayor who orchestrates this legalised robbery is Vadim (Roman Madyanov), who compensates the family with only a sliver of what the property is worth, leaving them financially bereft. Kolya’s old army friend, Dmitry, (Vladimir Vdovichenkov) is a hotshot Moscow lawyer, and out of close friendship, Dmitry offers to help Kolya appeal the decision on his land. He offers cool assurance and neatly articulated arguments by comparison to Kolya’s lumpen, emotional response and on first appearance, Dmitry seems the far more capable and sensible of the two. Yet, as the ensuing legal quagmire proves, coolly applied logic is potentially dangerous. Mired in local influences and anecdotally tied to the Orthodox church, the appeals hearing is inevitably a failure, a public official rattling off indecipherable legal jargon, flatly denying any intervention on Kolya’s behalf. Mayor Vadim, human refuse of the worst sort, later visits Kolya’s home, belligerently drunk and gloating about his success. A corrupt, venal man with a portrait of Vladimir Putin on his office wall, Vadim is guilty of any number of terrible deeds. Cleverly, Zyvagintsev leaves us to wonder about the specifics. In Leviathan, what begins as a direct take-down of Russian bureaucracy mutates slowly into a forsaken family drama. The plot could be said to contain elements of melodrama, but only if you stripped the dramatic moments of all their artificial tenor, peeling the layers back to their most basic, wounding humanity. It’s an appropriate emotional temperature for a director whose films are structured and told in beautifully pared-down, elliptical, visual prose. Seamlessly transitioning between scenes without effect, information is consistently withheld from the audience then matter-of-factly stated in conversation. Too smooth to be startling, too commonplace to work as generic twists, there’s an impression of characters constantly on the verge of spilling their guts; unspoken words always on their lips, but routinely stymied. Either through Zvyagintsev’s sudden ellipses or their own inability to communicate, these individuals are isolated from each other in terrible ways, the brittle semblance of community imploding violently on the egotistical whims of those with money and influence.